Full suspension and front swivels make it easy to maintain a smooth ride in every configuration. One-touch brakes keep the stroller in place when parked. A height-adjustable push handle, parent tray with two cup holders, and large storage basket provide added convenience for mom or dad. For children up to 50 lbs. The Q Collection is automotive performance at its best! Surround your child in cool comfort with breathable 3D AirMesh knitted in a stylish silver hue. 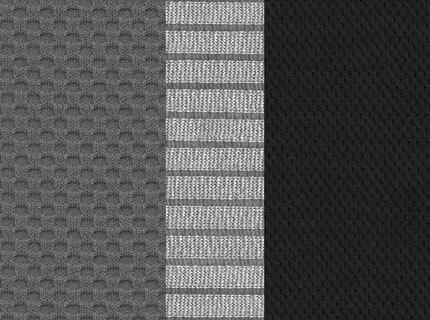 Layering texture on texture with a solid black micro-pattern knit, a raised geo grey knit, and perforated premium automotive black leatherette accents, Q Collection delivers a cool, comfortable ride with a premium automotive trim design. Carton Dimensions: 18.95" x 14.01" x 26.18"
Bravo Air Quick-Fold Stroller - Q Collection is rated 5.0 out of 5 by 5. Rated 5 out of 5 by MelissaB2253 from Couldn't be happier I am beyond happy with the bravo air. I couldn't believe how light it was and easy to push. The stroller has an easy one step folding up feature which is incredible. Makes packing in the car even easier. It works great with all existing infant car seats as well. I love how open the storage is underneath. There is a ton of space and is very easy to access. Lastly I love the adjustable handles. There are different settings for your height or how you feel comfortable holding it. After using other brand products with my first child, I'm becoming a huge fan of all Chicco Products with my second. I have yet to be disappointed. Rated 5 out of 5 by Justin11 from Everything You Could Ever Need! This stroller is everything we could ever need for our little boy! We absolutely love that you can simply remove the canopy to create a lightweight stroller and the KeyFit Car Seat will click right in. In addition, we love that as our little man grows, the Bravo will easily adapt into the stroller we will use for years to come while he's a toddler. Also important to us is how super easy it is to fold and that it's free standing when folded. This is a must have!! Rated 5 out of 5 by DanHogan25 from Another Great Chicco Product This is the second Chicco stroller my wife and I have purchased, as we purchased the Chicco Cortina stroller for my son a few years ago. We just picked up the Bravo Air Quick Fold stroller in anticipation of our second child. From the second we took it out of the box it was clear this might even be easier to assemble and use than our Cortina. Assembly was as easy as can be. We had it fully assembled in only a few minutes and were ready to go. It is extremely light and folds up in about 2 seconds after an easy pull of the handle. As always, Chicco equipment is safe, easy to store, and always looks great. It's safe to say I will only be using Chicco gear for everything we need for our family. Rated 5 out of 5 by MZizzi from Happy w/ this stroller's quality and ease of use! As soon as our stroller arrived, I opened the box while my husband was walking the dog, and I had it all put together within minutes before he got home! I was impressed with how easy it came together, along with how sturdy it felt once everything clicked. While using it with an 8 month old, I loved how he could lay mid-recline while he was drinking milk, and once he was done I adjusted it (while still walking - it's that easy) to allow him to sit up and he loved being able to see everything. I also loved the 3-way handle bars since i'm 5-1 and the lowest setting is perfect for me. The canopy and the kids cup/toy holder are super easy to get on/off as well. Overall, the ease of use paired with the quality are why I love this stroller! It's also easy for me to fold and carry around, which again isn't always the case being short. I would definitely recommend this product to any mom who is looking for convenience and bare bones quality with features that make it comfortable for both you and baby. The one and only con I can point out is the small cup holders, but there's add-ons you can purchase to get what you're looking for. Rated 5 out of 5 by KelseyH23 from Easy to assemble, lightweight and great quality! After reading reviews for what seems like every stroller out there, we selected the Bravo Air Quick-Fold stroller. Chico products have always come highly rated from my mom friends for their quality and safety. I couldn’t agree with them more! From the moment I took the stroller out of the box, I was pleasantly surprised about how lightweight it was! It assembled easily in 5 minutes- the instructions were easy to follow (and I am not a handy person!). Our daughter stays cool with the 3D AirMesh material, which is critical here in the south. She enjoys the three reclining positions and the comfortable ride. I can fold the entire stroller with one hand and load into my car in a flash! Despite it’s lightweight, it is very sturdy which is important to me. The large storage basket under the seat holds everything- the diaper bag, shopping bags and so much more. I wanted a quality stroller and this is exactly what I was looking for. I see that The Bravo stroller may be used without the car seat from 6 months to 50lbs. Is 50 pounds the maximum weight for the stroller? Is there a minimum weight and/or height? Please call customer service at 1-877-424-4226 for assistance. If I have the Bravo Air stroller, can I replace it with all terrain wheels? Or do I have to get a different stroller? Can you attach one of those boards for the older sibling riding standing up to the Bravo Air? The Bravo stroller will not accept a toddler platform. Please view our stroller comparison chart on our website www.chiccousa.com/stroller-comparison/ . We recommend that you view the BravoFor2 strollers. Can you clarify the weight or age the baby should be to safely sit in the stroller without the carseat? The Bravo stroller can be used with the Keyfit, Keyfit 30, or Fit2 car seat. The Bravo stroller may be used without the car seat from 6 months to 50lbs. Is the child tray detachable in the Bravo air? The child's tray is detachable on any Bravo and Bravo LE stroller. You can keep the canopy attached when using the stroller without the stroller seat attached. The Bravo stroller will accept the Keyfit, Keyfit 30, or Fit2 car seat. It will not accept the Nextfit or Nextfit iX car seat. Does the adapter to use the car seat with only the frame come included? This model includes the child's tray. Some models of the Bravo stroller may include the Keyfit adapter instead of the child's tray. Either the child's tray or the Keyfit adapter may be use to attach the Keyfit, Keyfit 30, or Fit 2 car seat to the Bravo stroller.